The Wild Animal Park in San Diego is a world famous conservation center. The existing transportation system was outdated and had be replaced. We worked on automated electric vehicles that are quiet, use wires embedded in the guide way to track vehicles as they move across the rugged natural terrain. This helps preserve the environment and maintain air quality. We worked on the vehicles and the design of the stations to maximize efficiency and safely transport guests around the park. 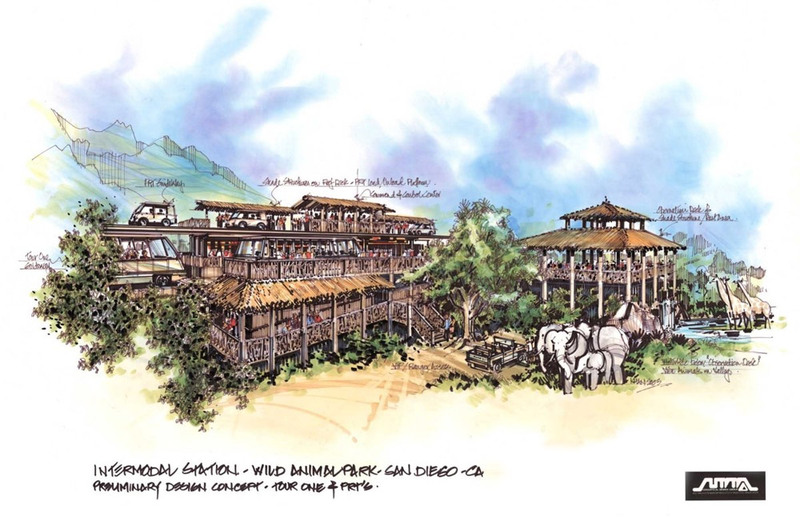 We worked with EEI to develop new vehicles for San Diego’s Wild Animal Park. A jeep for private tours and a bus with a capacity of 40 people was designed to take guests around the Park. The vehicles were powered by electric induction motors, picking up power from an embedded wire in the roadway. The system was designed to replace the existing monorail which is outdated and a hazard for animals. We also worked on the station concepts and the layout of the guide way for the Park.